Wanda will be exhibiting her work at the Evergreen Fine Arts Festival in Evergreen, Colorado on August 25 & 26, 2018. Wanda will also be participating in the Salida Studio Tour in Salida, Colorado Sept. 22 & 23, 2018. Wanda and her husband Daryl have relocated from New Bremen, Ohio to Salida, Colorado. Wanda now devotes even more time to art in her new studio. She continues to sculpt but also is devoting more time to painting. The life size sculpture “Partners” (the boy leading a mule) has been installed in front of the lock keepers house on the towpath of the Miami and Erie Canal in New Bremen, Ohio. It is located near the Southwest corner of S. Rt. 66 and St. Rt. 274. Wanda’s clay original was cast into bronze by Roger Smith at Michiganartcastings.com. This bronze is now a part of the Komminsk Legacy Park. Welcome, and thank you for visiting our website. Each bronze piece is cast from Wanda’s original clay works of art. 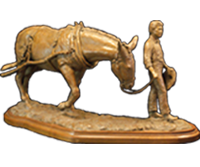 The age old lost wax process is the chosen method for creating high quality bronzes. This produces beautiful sculptures that can be cherished for generations.